The Western film genre creates a mythology of the West so powerful... it largely eclipses the factual history of the place, becoming an inhabitable mythology with a large place for cowboys and a small one for Indians. THE CONTEMPORARY FRONTIER presents research on the current status of the Navajo Nation, a Native American Reservation in both northern Arizona and New Mexico. The documentation presented focuses on the myth of the Western frontier propagated through the Western film genre in mid 20th century America and still today. This representation of the West differs greatly from the reality of the contemporary West, in which Native Americans are current inhabitants rather than long gone invaders and the only space left to conquer is the few natural resources remaining. This representation of the Old West as frontier space within the Western has seeped through into the current place of the Navajo Nation where it is confronted by the realities of complex political, environmental, and social issues in which the Native Americans still play a small role. With this comes a dilution of cultural self-representation mixed with American capitalist ideals and an inscribed dependency upon the United States Government and federal aid. 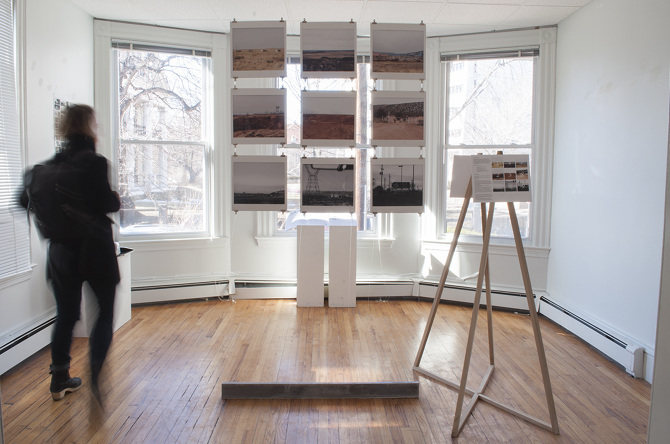 Research focuses on prevailing spatial and representational agendas within the structures historical western expansion, current infrastructure, and current Navajo culture/architecture.